First Gear Komatsu D475A-5EO Dozer Diecast Construction Model in 1:50 scale. This collectible Komatsu dozer replica measures approximately 9.75″L x 5″W x 4″H. Features diecast metal construction with working segmented metal tracks, dual till full-U blade, fully detailed operator control center, poseable single-shank ripper, authentic Komatsu markings, and more! 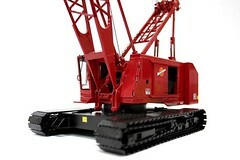 This entry was posted in Diecast Construction Models, Hobbies and Toys. Bookmark the permalink.